Pink Castle Blog: Enchanted Charm Pack Giveaway! Sarah Fielke, author and quilt designer, dropped by Pink Castle for an afternoon in May. While here, she talked to customers, signed books, gave a trunk show, and endured a tornado warning! As Mondays go, it was pretty exciting. 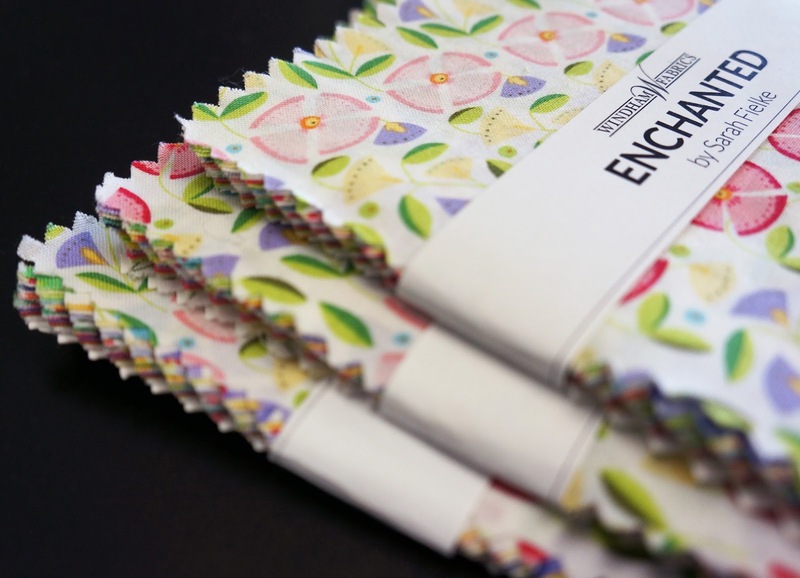 She also left us with a few charms packs for her first collection from Windham Fabrics, Enchanted. Enchanted is everything its name implies...bright and whimsical and more than a little magical. Imagine a peacock strutting through through the courtyard of a fantastical fairytale castle and you've got the idea. Of course, it would be selfish to keep such a wonderful treat to ourselves, so we're giving these three charm packs away to one lucky blog reader! All you have to do to enter is leave a comment telling us what you find so enchanting about Enchanted. We'll be picking a winner at noon on Friday, June 6th, so don't delay! We only have this one prize right now but Enchanted will be available at Pink Castle Fabrics in July, so keep your eyes peeled!